We all know that a pine forest is different from an oak forest, or that a dry, sunny hillside is different from a low wetland. Different plants grow in each, and different animals live there. 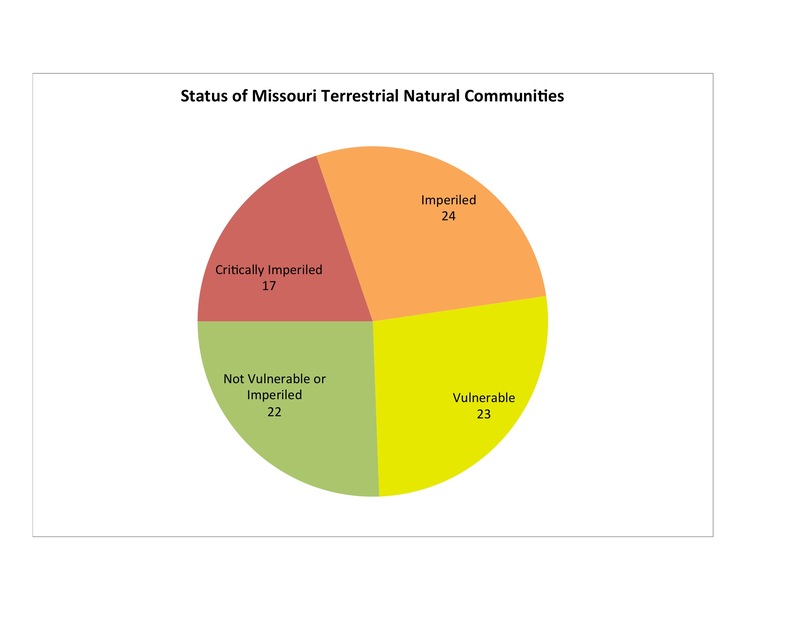 These different types of places are called Terrestrial Natural Communities, and according to a report by the Missouri Department of Conservation, Missouri is home to 86 types. Almost half of them are either imperiled or critically imperiled. Only about 1/4 of them are secure. Different types of savannas, prairies, and wetlands are the most endangered. The data is shown in the chart at right. The report also provides a list of 1,072 species that are of conservation concern. Sixty-four of them are officially listed as endangered by the state, but the report also classifies 399 species as critically imperiled. Overall, the 1,072 species on the checklist constitute 28% of Missouri’s vertebrate animals, 18% of Missouri’s vascular plants, and 14% of Missouri’s nonvascular plants. In a previous post, I reported that climate change is predicted to hit Missouri species hard. Given how many species are already threatened, it’s easy to believe. Missouri Department of Conservation. 2014. Missouri Species and Communities of Conservation Concern Checklist, January 2014. http://mdc.mo.gov/sites/default/files/resources/2010/04/2014_species_concern.pdf. By mogreenstats in Invasive Species, Land on 2014/06/18 .